--To have gone to a friend's house for Easter dinner. I didn't have to cook. Yay! --To not want to see the new Furious movie. Fast 7 I think it's called? Not for me. --To have liked the new show American Odyssey that premiered on Sunday. --To be recording Wolf Hall. It's about Henry VIII so I had to. --To have watched If There Be Thorns on Lifetime. I read all the books as a kid. They are doing Seeds Of Yesterday this Sunday. --To have a giveaway for the The Hobbit: The Battle Of The Five Armies Blu Ray DVD here. --To love the frosted lemonade at Chick-fil-a. I'll be going again this week to get another one. --To have dyed the dang eggs. I hate doing it. So messy, but the kids have fun. I like your eggs! No wonder the kids had fun! I'm not into the Fast and Furious movies. I've never seen any of them and when I mentioned that this weekend people thought I was crazy....it's not my cup of tea. I keep hearing about Wolf Hall. Guess it's based on a book that I never heard of! Yay for not having to cook, that is the best! Glad I'm not the only person in the world not interested in that new Fast and Furious movie. It seems like EVERYONE is posting about it, and I have zero desire to go see it, haha. We met my parents for brunch halfway. I don't think I've cooked for Easter for the past 3-4 years! And we ran out of time to dye eggs, but the kids still want to do it this coming weekend. Whatever! They like eating hard cooked eggs and I already bought the kit! Seeds of Yesterday?!? Crazy. Maybe they'll do Garden of Shadows too? I liked that one almost more than FITA. I wonder if they'll do the Heaven series next. The eggs came out great. Frozen Lemonade sounds really good! 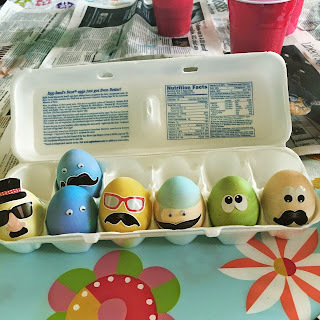 I didn't cook anything special for Easter - we were sort of lame this year!!! I wish we had a free standing Chick Fil-A - the only one we have is in the mall and I rarely go. Those eggs are so cute. Fast 7 so boring..I hated the first one. And yes to If There Be Thorns!! You know I watched lol. I was going to post about that! Your eggs turned out great! I should've went out for Easter, lol. I want a frozen lemonade now. I can't wait to try the frosted lemonade! I love their regular lemonade! Are those your eggs? They look incredible! I've never seen any of the fast and furious movies so I wouldn't start now. 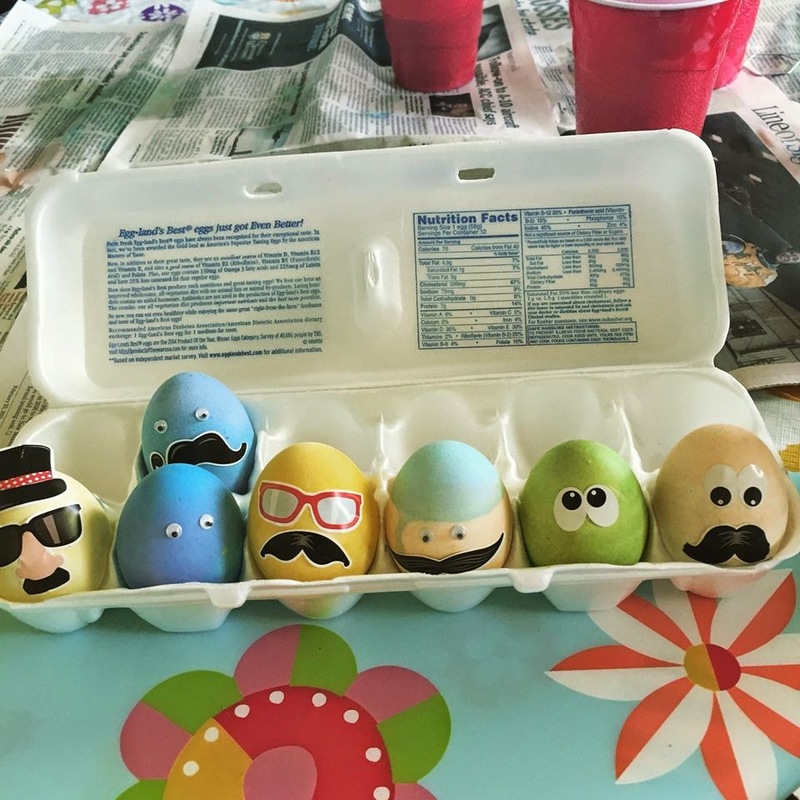 The eggs turned out great! I had my first frozen lemonade from Tim Hortons today...it was pretty good and it means that warmer weather is on it's way!! I reread Flowers in the Attic and If There Be Thorns on audio a couple of years ago--before I knew they were making movies. I watched the Lifetime Flowers in the Attic but I couldn't get through the whole thing. I think it's because I'd just read the book--there was such a different feel from reading it as there was from it being acted out on screen. My mother in law cooks Easter dinner every year. It's wonderful to get a holiday off from cooking! I am so glad when we are done with the eggs and nothing was destroyed or dyed blue that shouldn't be!